How can I save my skin? Strategies for healthier skin and achieving that “glow”. How can I save my skin? Strategies for healthier skin. Lets talk skin complexion. everyone wants to have that perfect skin and glow right? the truth of the matter is that you can’t exspect perfect skin without putting in the work because the reality is that medical spa treatments can only do so much for a person that burns the candle from both ends ( tanning, drinking, smoking, poor diet, etc)! We need to talk about a wide range of skin supporting lifestyle choices you can use if you want to get that perfect skin and the “glow”! 1. Drink Water! The skin is our largest organ and one of the most valuable things we can do to not look weathered is drink water. It is suggested that men and women should drink between 9-13 cups of water a day, its important to note that this is also dependent on many conditions such as sweating, excessive drinking, smoking, etc. So in these instances we would want to be drinking more water. When we are dehydrated our organs have a very hard time working efficently. Dehydration affects the natural detoxification of the skin. So drink up! 2. Protect your skin! Everyone loves to look sun kissed, however this is arguably the worst thing you can do for your skin. exposure is primarily the biggest negative when it comes to pre-mature skin aging. What does the sun do to your skin? First of all it contributes to the break down of collagen which will give your lines and wrinkles, but it also causes hyper pigmentation and malasma, which are discolorations many people call sun spots, which are next to impossible to remove. If you are going to be in the sun its important to wear a true sunblock which blocks UVA and UVB Rays. Products with ingredients such as Zinc, and Titanium work best! Check out these great sunblocks. Protect the skin your in! 3. Cleanse! It is said that at least 92 percent of the population lives with substandard air. environmental pollutants such as carbon monoxide, nitrogen dioxide, and smog. These can be the root cause of premature skin aging, pigmentation , and acne. What can we do? Its important to wash your skin at least twice a day. If you don’t wash your skin at night, its hard for your skin to repair itself as it has to deal with all the pollution that is on it from the day. You should wear a Antioxidant Cream, something that will help destroy the free radicals on your skin! Here is a great one. You can also wear a barrier cream such as a sunblock which will help to protect you from pollution. Check out these great cleansers and match them to your skin. 4.Balance your diet! 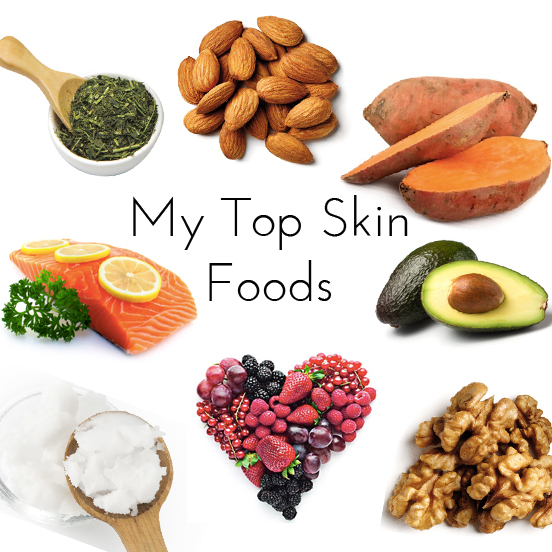 Eating right is one of the easiest things you can do for your skin, taking in foods that are high in protein will help your body to support your collagen, elastin and other fibers that make the skin look healthy, and firm. Fish can help get you the omega essential fatty acids which help with the skins cells. Foods that are a natural anti-inflammatory are great to beat that flush! Here are some other quick food tips. Carrots & Sweet potatoes (vitamin a), citris and broccoli (vitamin c), nuts and olives (vitamin e) . 5. Sleep! The expression “Get your beauty rest” is actually incredibly important. It really important to give your skin and body that chance to repair which happens when your sleeping. Lack of sleep causes puffiness inflammation, weathered looking skin. Last time I checked I had not met anyone who wanted dark circles under their eyes. 6. Work out ! physical activity can do wonders for your complexion. When we work out we have increased blood flow which delivers vital nutrients and oxygen to the skin cells. that being said we can slow down skin aging by simply working out. How can I take care of my flushed skin? Inflammation is a response by the body to a real or perceived threat. we need the inflammatory response because its the only way for healing to occur, however over time inflammation of the skin can cause cells to lose water and dehydrate the skin. 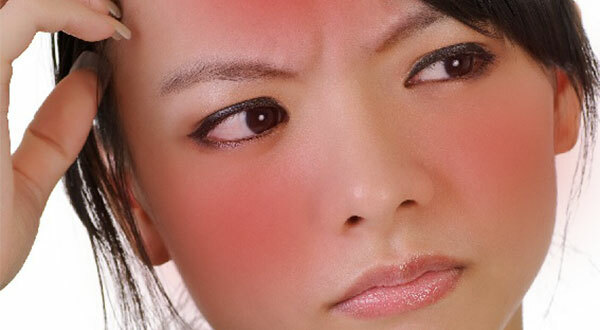 Some of the common causes of skin inflammation are sun exposure, stress, environment, diet, or even lack of sleep. So how does this show up for us? It can come in the form of rosacea, rashes, eczema, psoriasis, acne, or wrinkles. Inflammation is one of the most powerful aggressors to accelerate aging! Inflammation has the power to show us when we are not getting enough sleep, when we are consuming too much alcohol or sugar, when are eating a poor diet, and the list goes on and on. The Longer you let these go on for the more serious the consequences will be. Did you know that over 90 percent of the earths populations lives with substandard air quality and pollution? these are aggressors that we can not control. There are steps you can take though to protect yourself from poor air quality and pollution, and that is to wear your sunblock! We can also use skin care that is rich in botanicals or antioxidants. taking small steps in your skin care routine and diet can have extremely beneficial outcomes. lastly its important to exercise because if you live and active and healthy lifestyle you are 15% less likely to have chronic inflammation! lets face it, many people have a fear of skin care that contains oil. This is where the “oil-free” craze in skin care came from. I even sell an oil free moisturizer for that reason. I get asked all the time. Do you have any oil free products? Well I have news for you, oil is not all bad. Our skins job is to adapt to environmental changes. Every time we strip the oils from our skin with our routine, our skin needs to kick oil production into overdrive in order to protect us from moisture loss and to re-balance.